The full McLaughlin-Sherouse List, which ranks all industries in 2014, is available in the data accompanying this chart as well as on the data tab at RegData.org. Recent research has shown that heavy regulation reduces entrepreneurship and employment opportunities and can divert investment from the most productive uses. The accumulation of regulation has also been associated with diminished labor productivity growth. On a macroeconomic scale, the buildup of regulation has slowed economic growth by an average of 2 percentage points, according to a study published in the Journal of Economic Growth. Policymakers should consider how existing regulations target certain industries more than others and whether heavy regulation of some industries is conveying enough benefits to justify the associated costs to the economy. Toward this end, the database RegData allows one to calculate which industries are most heavily regulated. 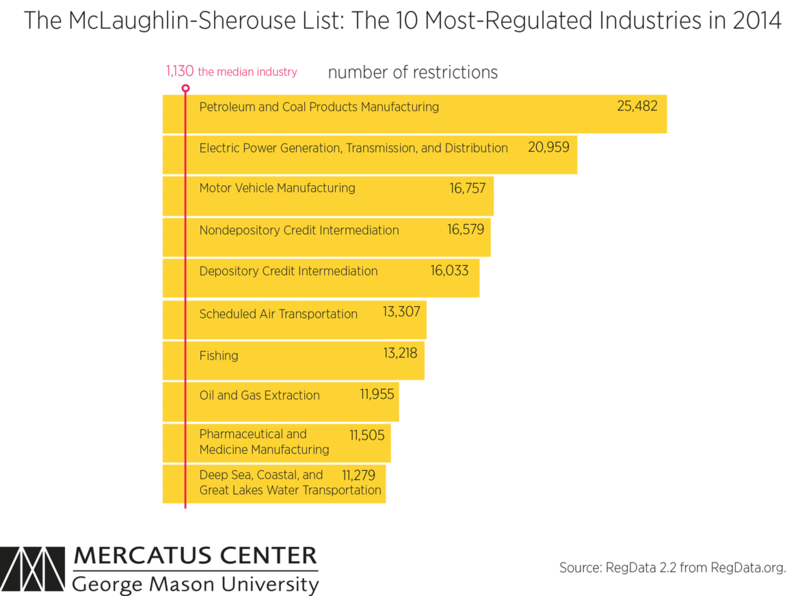 The figure below shows the 10 most federally regulated industries in 2014, according to RegData’s Industry Regulation Index, as originally conceived in Al-Ubaydli and McLaughlin’s 2012 working paper. Federal regulations that year targeted the petroleum and coal products manufacturing more than any other industry. The second most targeted industry was electric power generation, transmission, and distribution. Overall, three types of manufacturing made the top 10 of the McLaughlin-Sherouse List (petroleum and coal products manufacturing, motor vehicle manufacturing, and pharmaceutical and medicine manufacturing); two types of financial services industries (nondepository credit intermediation and depository credit intermediation); two modes of transportation (scheduled air transportation and deep sea, coastal, and Great Lakes water transportation); and two industries involving natural resources (fishing and oil and gas extraction). What does it mean for a particular industry to rank highly on the McLaughlin-Sherouse List? For starters, it means that companies in those industries probably must engage the services of a small army of regulatory lawyers to help them navigate these rules. More important, it provides a road map for researchers and policymakers. While the research cited above has shown, at a general level, that regulatory accumulation can harm economies and industries, the ranking prompts additional avenues of further research and investigation: Are there any specific outcomes in the industries that may justify their positions? Have the negative effects, such as lower labor productivity growth, been observable? The full McLaughlin-Sherouse List, which ranks all industries in 2014, is available in the data accompanying this chart as well as on the data tab at RegData.org. Al-Ubaydli and McLaughlin’s 2012 working paper (updated in 2014) explains how to calculate the Industry Regulation Index, although the chart above uses the more recent RegData 2.2 database instead of RegData 2.0.